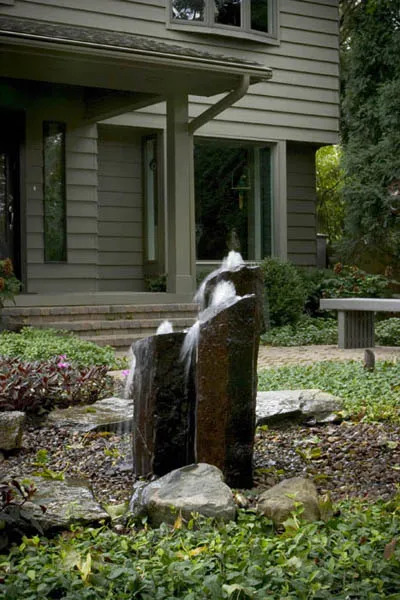 Decorative water features are a unique and beautiful way to give your landscape a fresh face. 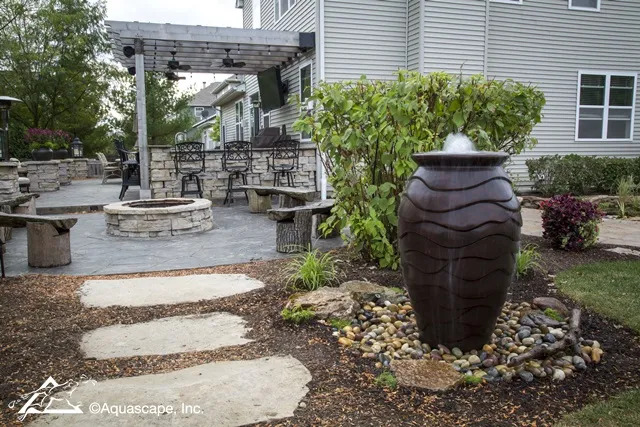 Fountains and Patio Ponds are quick and affordable landscape ideas to add a splash of water to your outdoor living spaces. 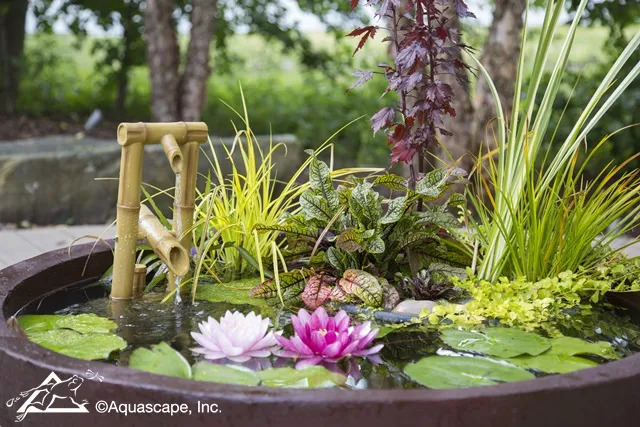 We’ve gathered some of our favorite small space water features to inspire you to add the sound of water to your gardens. 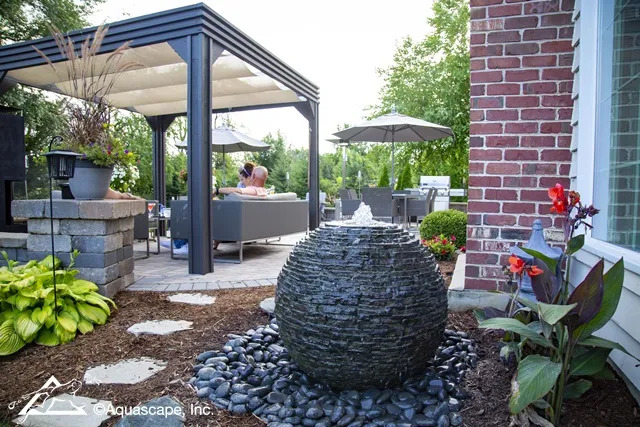 Our newest fountain is the Stacked Slate Sphere that looks great in any setting! Enhance a walkway or patio with this water feature that’s available in three sizes. Group them together for a statement piece in your landscape. The Stacked Slate Sphere is available in three sizes and you can light it up at night, too. Birds and butterflies will visit the fountain for refreshment and you’ll enjoy gazing upon its beauty both day and night. 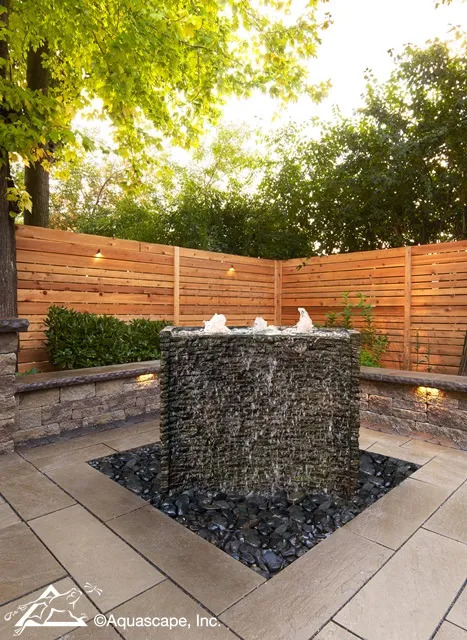 Fill an unused space in your yard with this stunning fountain. Made with the same finish, a Stacked Slate Wall is impressive wherever you tuck it into your landscape. You can link these together to create a unique focal point. Of course, they look great as a single fountain too. Decorative fountains are popping up in yards all over the country as more homeowners look for unique ways to improve the curb appeal of their house. An underground reservoir holds the pump and water that recirculates through the fountain. You’ll find a variety of fountain styles to suit your taste and budget. A trio of stone fountains welcomes visitors to this suburban home, adding to the home’s value with its increased curb appeal. Rather than an expanse of grass or a large bush, the homeowners opted for beautiful fountain rocks which can be seen through their living room picture window. If you prefer something a little more elegant, you might enjoy a series of bowls spilling into each other. The best part of Aquascape Spillway Bowls is that you can link several together in a variety of patterns. 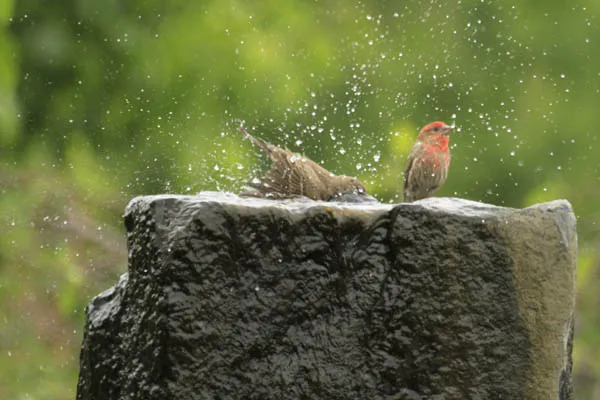 Birds and butterflies enjoy visiting outdoor fountains to enjoy a refreshing splash or nourishing drink. 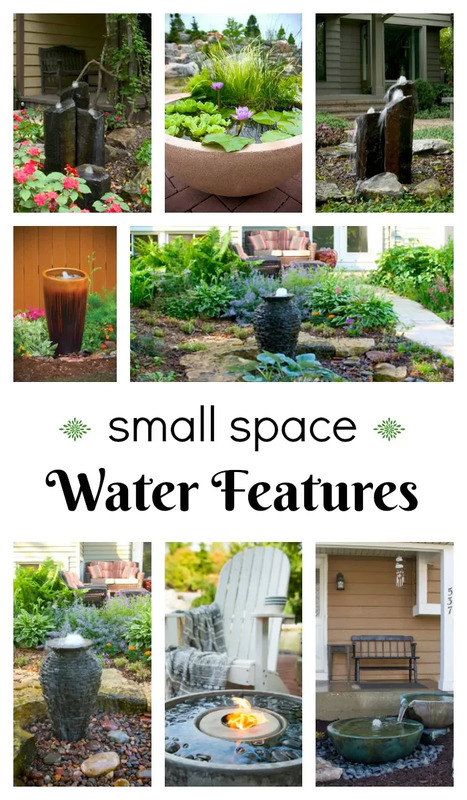 Every nature lover will enjoy the many benefits of decorative small space water features. And why stop with just one fountain? Place them in nooks and crannies throughout your garden spaces. 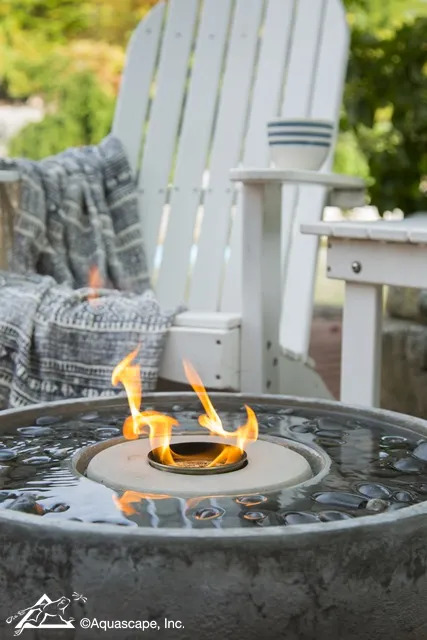 One of the fastest-growing trends in outdoor living features is the combination of fire and water. Our popular Fire Fountain creates a soft, pleasing sound of water as it flows over and around the pebbles. Fire adds a surprising element that looks great at night, too. 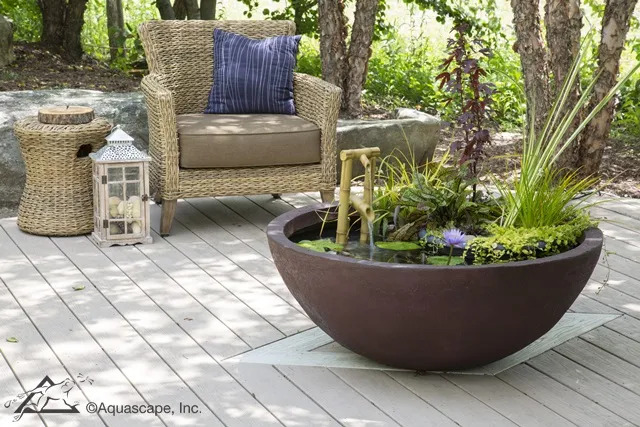 Miniature water gardens, also known as Patio Ponds, are becoming increasingly popular on patios and decks. These small-scaled ponds provide the opportunity to enjoy beautiful waterlilies in a variety of colors. You can even add small fish like Rosy Reds. Kids love watching the tiny fish swim and you can bring them indoors when winter rolls around. 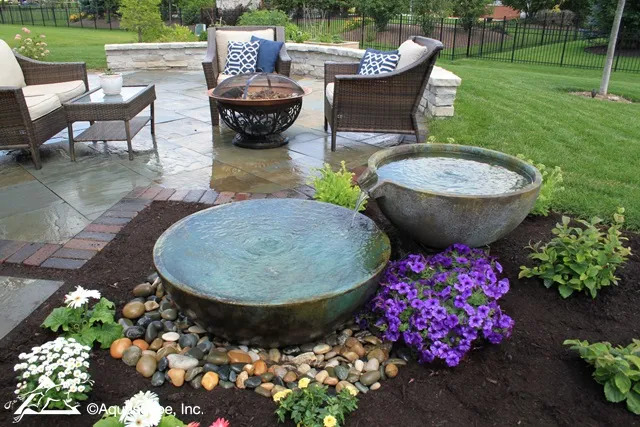 Whatever you choose, you’re sure to enjoy the beauty and refreshment that a small water feature adds to your outdoor living spaces! Check out this AMAZING city yard transformation! This City Yard of Water is an absolutely incredible example of what can be done in such a small space. The small backyard in Lancaster City was completely transformed from grass and weeds to this MASTERPIECE you see before you! Project included installation of an Aquascape Ecosystem pond complete with pond plants, fish, Stepping stones through the pond, waterfalls, fish cave for heron protection, algae control system and bacteria dosing system all designed to make pond maintenance user-friendly. Pond is approximately 21’x26′ with a 15′ stream/waterfall which starts in the far back corner of the yard which was an otherwise unusable space. There’s nothing more relaxing and invited then the sound of running water and this backyard is going to be a relaxation paradise. Testing out the “Beast” wet tile saw on a large Porcelain tile outdoor living area. While on this job we’ve tried just about every method and style of saw to cut through the porcelain tile pavers but none would do the trick. That is until our good friends at Watson Supply put us on to the “BEAST”. The BEAST 10″ Wet Tile Saw provides large format capability in a portable frame. This new saw has been manufactured with incredibly tight tolerances, stainless steel hardware, superior materials, and designed as a true professional level tile saw. The new BEAST10 has the largest cutting capacity in its class and is accurate to within 1/32″ over a 24″ cut. The BEAST10 is capable of performing a diagonal cut on a 24″ x 24″ tile and can execute a 34″ Rip Cut (39″ Rip with plunge). The plunge cut feature makes it easy to execute V-Cap cuts, cut-outs for wall sockets and much more. Each saw comes with a removable table extension for large format tiles and an innovative snake pipe water nozzle which allows for precise water control and placement. An optional side plastic water tray will catch drip and divert water back to the water pan. The durable steel pipe saw frame is constructed to withstand the toughest conditions any contractor will experience. The BEAST10 has a 3-year warranty. The first of couple of videos coming to you highlighting our trip to Logan Paul’s house in Los Angeles, California. We traveled all the way to LA to meet Logan Paul at his house and with the help of our amazing Certified Aquascape Contractor brethren we build him the pond of his dreams!!!!!!!!!!!!! The videos in this post highlight traveling to LA as well as going to logan paul’s house and the first day of construction for the amazing water feature. Check out this amazing Natural Stone Living Area backyard transformation. What was once a small deteriorating patio with patchy spots of lawn has been completely transformed into an amazing outdoor living and dining space. Having a tough time deciding on concrete pavers vs asphalt for your driveway or outdoor living project? 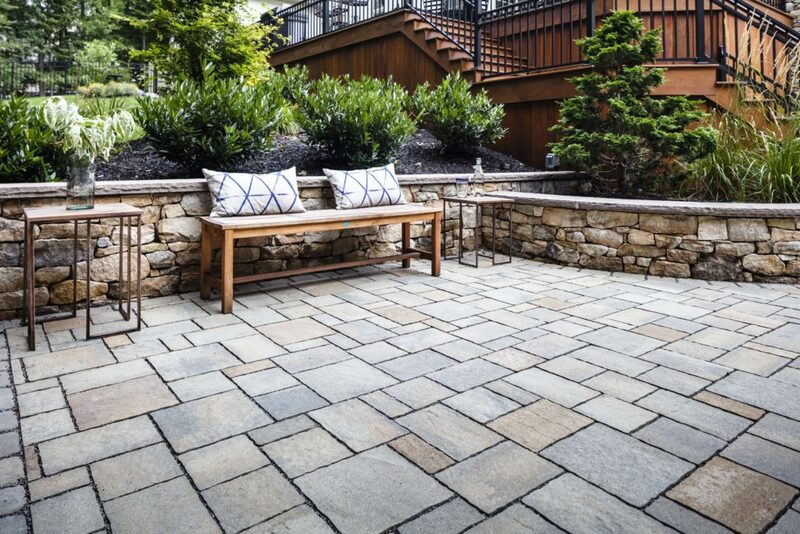 This should be a no-brainer, but lucky for you our good friends at Techo-Bloc have you covered. Below you will find tons of information helping you to make the decision in the Pavers vs Asphalt battle. Do I install interlocking concrete or asphalt in my driveway? 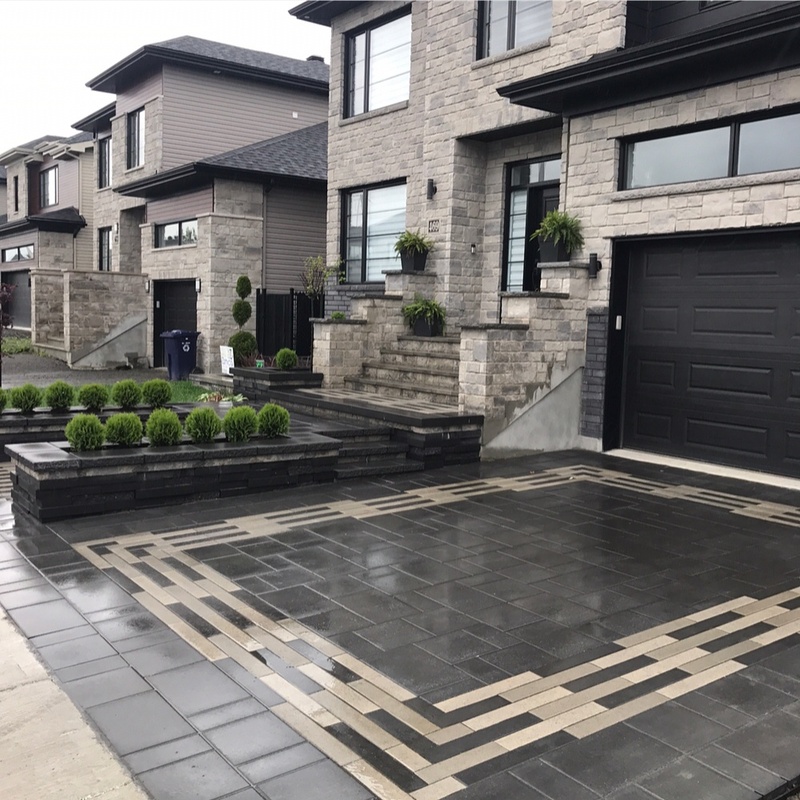 Design and patterns: Interlocking concrete is available in endless colors, textures and dimensions to create the patterns, mosaics that will increase your home’s curb appeal and make your front entrance stand out. For more details on patterns, press here. Color: Asphalt only gives you one choice. Black. In contrast, interlock offers a variety of colours and textures, which can accent, highlight and compliment your existing home’s colours and features. Colour is key in tying your front entrance to your home and, ultimately, creating one continuous and harmonious look. Ease of repair: With interlock pavements, if damage, cracks or spills occur, affected pavers can be easily removed and replaced with new units. Keeping spare units from the initial installation lets you easily switch the stained units when these circumstances occur. On the other hand, when asphalt cracks, suffers staining or other damages, it does not repair as well. Coating and patching are possible, but never look as good as new. 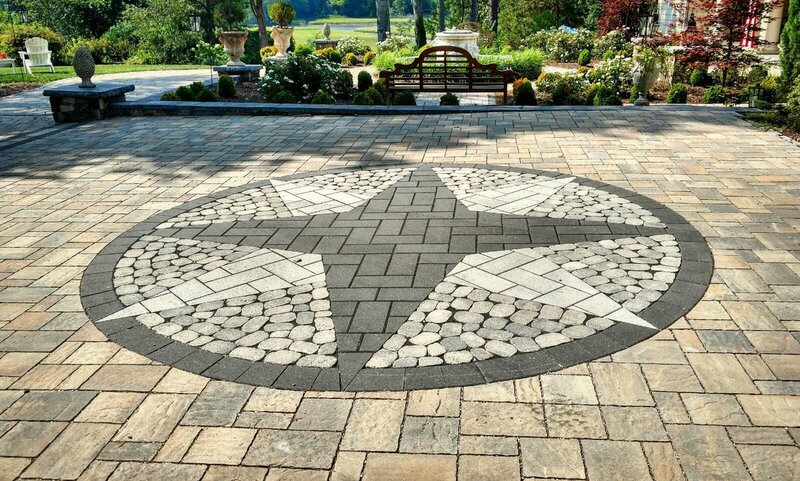 Flex of the system: Interlock paver systems are naturally flexible. In other words, interlock pavement systems flex with the movement of the ground during freeze-thaw cycles, and then gradually settle back down. Asphalt is not a flexible system. In most cases when the ground moves, asphalt will move and crack with it. The seams between the pavers allow for flexibility in the system so cracks occur in the joints and not on the pavers. 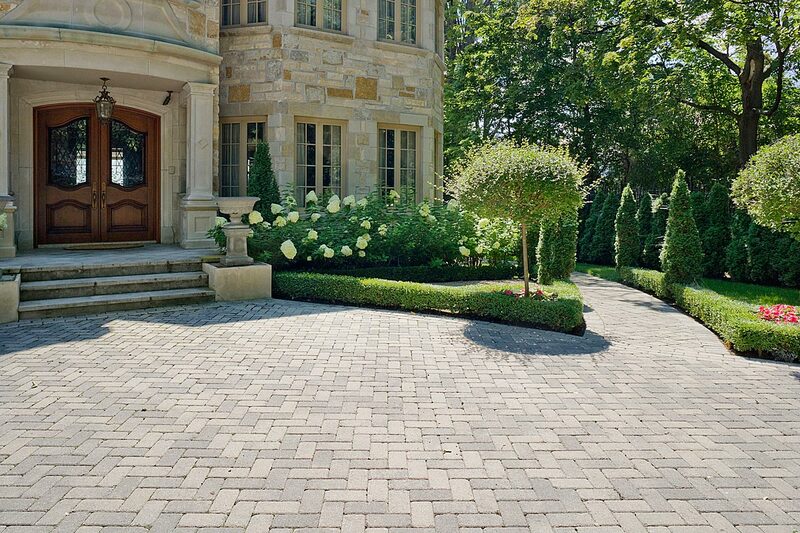 Property value: The natural stone appeal of interlock is arguably far more pleasing to the eye. Therefore, it is a far better investment than asphalt in terms of increasing the resale value and curb appeal of your home. Durability: Point blank, interlock pavers just last longer than asphalt. In fact, they also require less maintenance and repair over the years. After all, no one wants potholes in their driveway. 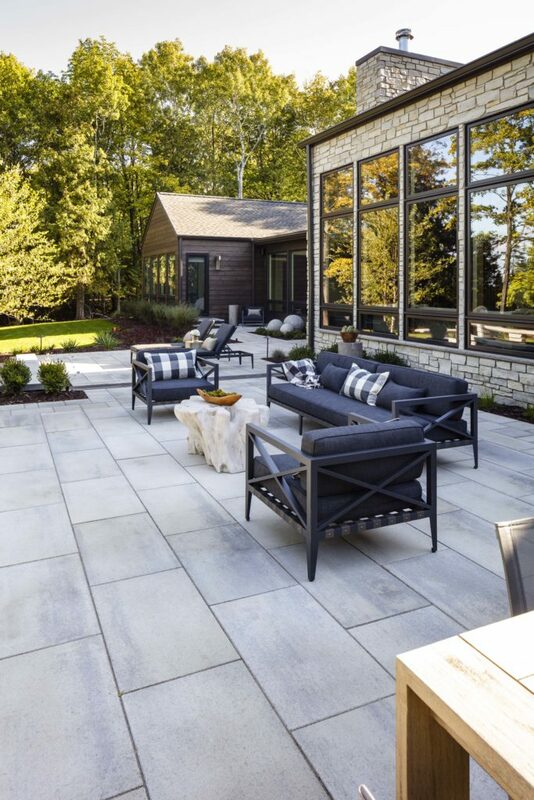 Techo-Bloc offers a transferable life-time warranty on interlock pavers that cover matters like salt resistance, which is especially crucial for those who inhabit northern regions. In short, asphalt cannot stand time like interlocking concrete can. Costs in maintenance and repair: Maintenance costs also need to be evaluated when considering whether to choose asphalt or concrete products. As previously mentioned, there is virtually little to no maintenance required with interlock pavers other than perhaps a pressure wash from time to time based on your tolerance to dirt. However, asphalt involves sealing costs every 2-3 years in order to help keep it looking new and in good shape. Regular maintenance is a must to keeping asphalt looking it’s best. With interlock, sealing is an option, but certainly not a necessity as it will look beautiful for years to come regardless. This Natural Stream Bank Stabilization project is the third phase of the overall project. 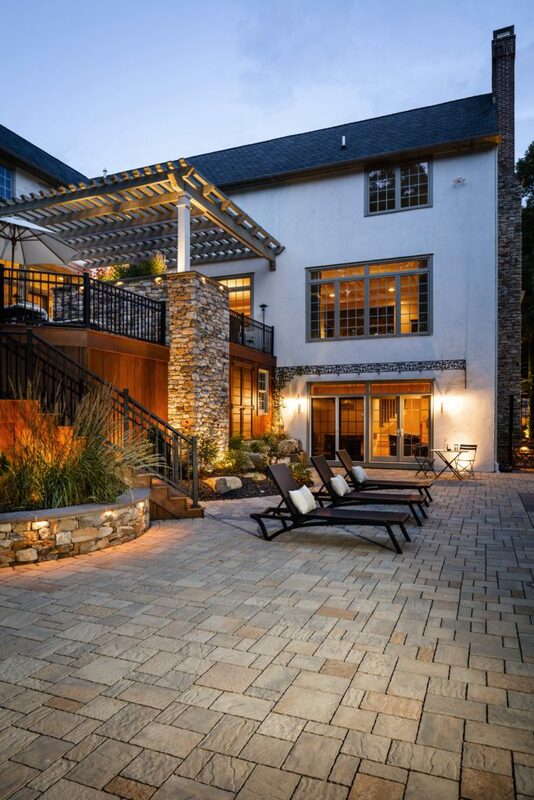 The third phase of the project included installation of the stream retaining wall stretching from the existing stone wall and running beyond the existing garage approximately 115′ linear feet. We widen the stream towards the bank side and constructed the retaining wall on the street side of the stream approximately 3-5′ in height as needed. The stream bank retaining wall is constructed of manufactured large wall stone system that interlocks between pieces for a solid finished product. The Rosetta Wall is a giant difference between your average landscaping wall. The massive size and weight of the outcropping system makes it visually striking and extremely strong. Phase 2 included This natural stream restoration project is located in southern Lancaster County, PA. The project consisted of removal of existing deteriorating stream bank supports. We then excavated the banks of the stream to allow for installation of new natural stone retaining walls. The stream was also widened slightly to improve flow and help prevent future flooding. This was an additional phase of a larger project. Below is some pictures of the stream restoration. Below that is another project video from the other phases of this project. Phase 1 includes installation of a multiple tier terrace boulder wall in the large embankment at the rear of the property. Above the top tier of the boulder walls we be a natural flagstone patio and fire pit with an additional boulder retaining wall around the patio seating area. The fire pit will be a natural stone 48? 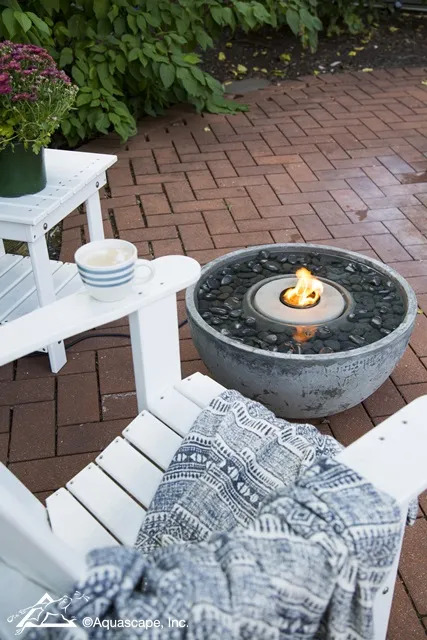 fire pit with wood burning smokeless fire pit insert. We installed natural stone steps on each tier of the wall for ease of access to the patio. Also included was installation of of a natural stone stepper walking path for access to the top of the embankment into the woods. The project will be finished off with plantings and landscape mulch beds throughout the property. There are other phases of this project still in the planning stages. Stay tuned for more on this project in the near future. 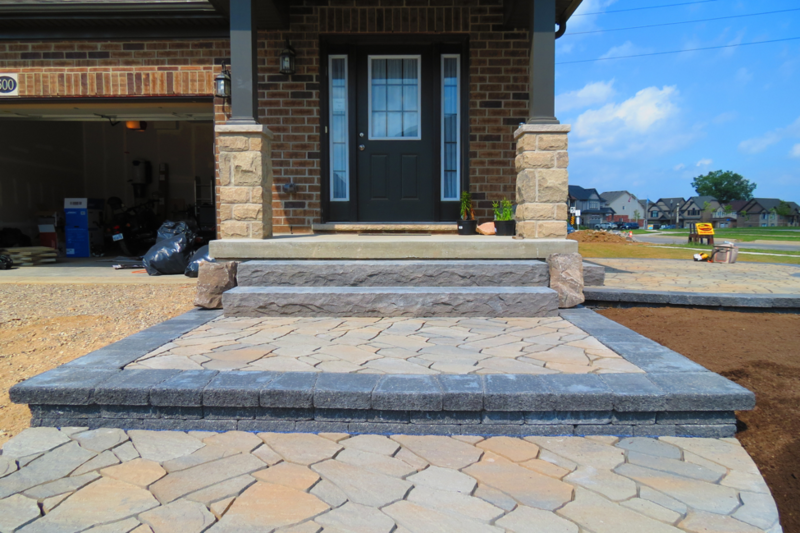 This Waterfall with stone steps project included installation of two tier stone steps. At the end of each set of steps is a natural flagstone landing. A natural stone bridge separates the stairway and crosses the water feature. A flagstone path leading from the upper landing and reaches across the backyard ending around the side of the house at the driveway. The pondless waterfall stretches approximately 23′ in length. With a few small waterfalls throughout the stream the pondless feature finishes underneath the large natural stone bridge with a final grand fall. The water feature includes several LED lights in the for night time viewing. As with all our water features this pondless was constructed with Aquascape products. This project was installed in Lancaster, PA. As part of a larger project this waterfall and stone steps portion in only the first phase. Additional landscaping and masonry work will be completed in the future. In a recent University of Michigan study, a backyard update was shown to boost property values up to 11 percent. That means that if you’re looking to boost your home’s rates on your next evaluation, your best bet may be to head to the backyard. But sophistication counts, researchers found. Homes that featured a curated, professional look scored significantly better among buyers. Meanwhile, landscape updates perform well on cost-versus-value reports as well. Decks, in particular, fare well along these measures. In 2016, a midrange deck recouped 75 percent of its cost to install, beating out both bathroom and kitchen remodels. For context, the overall cost-versus-value rate for improvement projects in 2016 came in at around 64 percent. That means you stand to reap substantial benefits by investing in your lawn and outdoor living spaces. In fact, some experts indicate that a $20,000 backyard update investment here could net around $200,000 when you resell. That means every 1$ you put into the backyard is worth 10$ in improved value. Still, some improvements perform better than others, and it pays to stay up on outdoor trends. Here are a couple of projects that will do the most for your home’s bottom line. Landscaping and interior design experts both have been excited recently about the concept of the outdoor living area. The idea is to create spaces perfect for leisure and enjoying pleasant weather and nights spent with loved ones. Meanwhile, open indoor rooms with large windows and glass doors give full views of your landscaping and outdoor panoramas. To get the look for your outdoor space, extend your patio out past its current boundaries. You can implement circular cutouts for trees, shrubs, or attractive flower beds, lined with pavers. 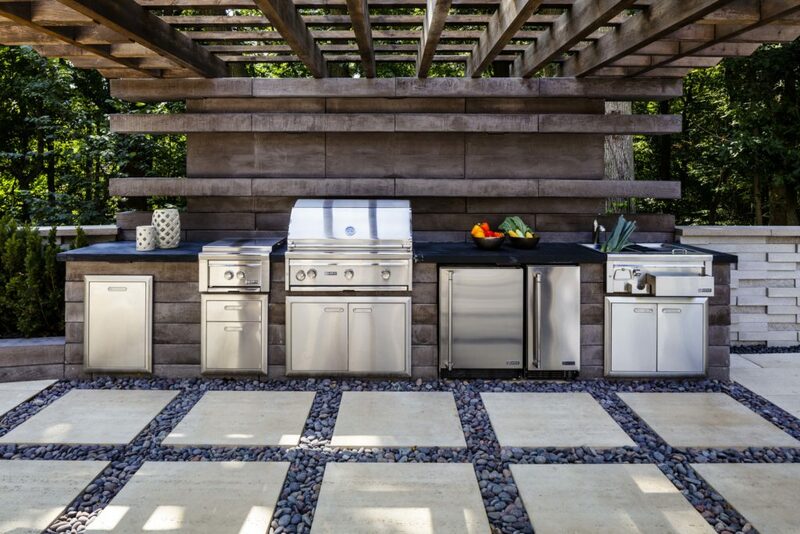 For the ideal outdoor hosting spot, add a dry stone fire pit or an outdoor kitchen with a stone countertop and grill. Backyards offer a chance to show off your home’s water efficiency, as well. Irrigation systems labeled with the EPA’s WaterSense seal carry weight among environmentally-minded homeowners. This is especially important if you want to resell or add value to your home. As you might predict, interest in water-efficient properties soars during periods of drought. But homes labeled with any kind of green certification tend to do well on the market. One study noticed a nine percent premium for properties carrying such labels. Using EPA-certified products lends credibility to any water-efficiency claims your realtor makes to potential buyers. Surveys consistently demonstrate home shoppers’ rising interest in green properties. For instance, in one such study, an overwhelming amount of homeowners—up to 94 percent—who had purchased a green home in the past said they’d readily recommend such properties to a friend. What’s more, 91 percent said they would definitely choose a green home if they were to relocate. Fifty-five percent said it didn’t even matter to them that their green home cost a little more than a conventional home. Many of the most advanced irrigation controls are WiFi-connected and programmed to pull in data from local weather forecasts to prevent overwatering when it rains. They also time sprinkler use so that it’s just enough for the local climate. This can reduce water use by as 8,800 gallons annually, according to the EPA. Another great eco-conscious option is permeable pavements. These allow for the proper percolation for surface water into the ground and reduce the risk and severity of flooding. Hence, they are great solution when designed as a means for water harvesting. In colder climates, they speed up the melting process of snow, reduce winter hazards and cost-savings on de-icing salt and snow removal. Many states/municipalities encourage the use of permeable pavements by offering tax incentives and utility fee reductions. You may want to check with your local government to see if they offer local incentives for their use. Succulents or ornamental grasses can give a backyard an edgy flair and reduce the home’s water footprint. They’re lovely when paired with stone pathways or in flower beds built with retaining walls. They also beautifully complement the hardscaping projects mentioned in the section above. Many high-end outdoor spaces now concentrate on lighting, even when the sun starts to fall. Surveys show that 84 percent of respondents consider a home’s landscaping to be a determining factor in whether or not to purchase a home. Outdoor lighting helps you make the most of this and adds sophistication to your property, no matter what time of day you wind up showing it. Dramatic uplighting highlights unique architectural features on your home. It can also draw attention to ponds and fountains, trees, fences, and other eye-catching areas in your yard. Meanwhile, downlighting adds a welcoming feel to patios and other exterior seating. And there’s a lot more to it than floodlights. Circle cored LED paver lights can be concealed in your walkways and bounders. This allows you to add bright accents along paths or walls for extra ambience in your exterior living spaces. For an enchanting look, try the LED lights that look like miniature sculptures. For a more classic look, opt for the LED string lights controlled via WiFi. Uplighting landscaping features for dramatic effect is an art all to its own. For that reason, you may want to consult with a professional for this part of your landscaping efforts. Complicated landscaping designs like installing water features, retaining walls, and hardscaping projects can often use a trained eye and a little expertise. Professional landscapers can advise you on the best types of designs to fit your climate and outdoor aesthetic. They’ll also have experience pulling permits if they’re required for your larger projects. A landscaper can also take the guesswork out of construction jobs, such as hardscaped seating, fire pits, paths and stone walls, and tiered courtyards and garden walls. Typically, professionals charge between $50 to $75 an hour. Still, most will draw up designs for you to DIY if you want to save money and do some of the hard labor yourself. Smart landscaping, better lighting, and enviable stone features will give professional polish to your exteriors. But watch out—you may just make the neighbors jealous! What is a Staycation you ask? A staycation is a vacation that is spent at one’s home enjoying all that home and one’s home environs have to offer. Why spend boat loads of money on a go away on vacation for only a short time during the summer? When you can invest in your own property with an outdoor living space that can be used year round at your own convenience. You can have an amazing getaway designed and installed in your very own backyard. Not only does this give you the opportunity to relax and entertain at your own leisure, but it also adds value to your home and property. Why not invest in something permanent opposed to just a brief getaway? The list of outdoor living elements that can be custom designed and installed to your families needs are almost limitless. Just imagine having your own outdoor entertaining or relaxation area just a step outside your backdoor. A customized outdoor kitchen with a smoker, grill, or even a wood burning pizza oven. Outdoor dining and living areas. Wood burning or gas fed fire features and fire places. poolside paver or natural stone patios. Large roof structures complete with outdoor television, wi-fi, and outdoor audio. Ponds, Fountains, waterfalls, or even large swimming ponds. How bout a large natural stone waterfall flowing into your pool? A hot tub hide-a-way. And LED landscape lighting so you can enjoy your outdoor living space through the evening hours.